Do Dog Clothes Make The Pug? Dog clothes have become very popular. It’s a pretty safe bet that the dog owners take more pleasure in this area than the dogs. Pugs are fairly cooperative when it comes to getting dressed up for their owner. This obviously depends on the individual dog and, no matter what anyone else says, you know your dog the best. If your Pug runs the other way when you get out “your” favorite outfit, he’s obviously sending you a message. Pugs, by nature, are quite comical and, in general, will try anything once. On a cold day a little sweater may actually be quite welcome by your furry friend. A word of warning about clothing in the summer for your Pug is appropriate here. 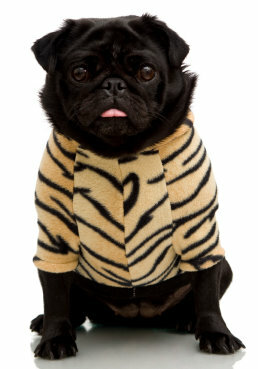 Dog clothes are cute but you need to be very careful not to let your Pug “overheat”. This applies not only in the summer but for anytime you want to dress up your pet but he will be staying inside. Remember dogs release their body heat by panting. Your Pug has a less efficient respiratory system because of their head structure. Their flat face (they are called a Brachycephalic breed) inhibits their ability to release heat. Rapid panting is a warning sign that your dog is being stressed in his effort to regulate his temperature. Make sure all clothing is off your dog if he is exhibiting these symptoms. 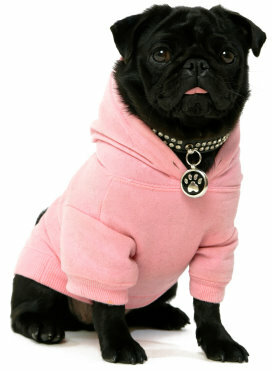 Safety should be your primary concern in choosing any dog clothes for your Pug. Make sure the clothing is not too big which could cause tripping or becoming tangled in the clothes. Clothing that is too small could also be a problem because it may be too restrictive. The bottom line is that clothing is something that usually something that makes owners feel better than the Pugs. There is absolutely nothing wrong with buying an outfit for your dog but safety and health concerns should be the primary concern here. Having said that, there are some rather cute outfits that are available and they are made to be safe. Holidays are great occasions for getting your Pug “dressed to the paws” and, as you know, they love to be the center of attention. The best way to get your dog to at least tolerate a wardrobe is to get them started early and not to force anything on them. You’ll soon have one of the best dressed dogs in town. For more help on having well trained Pug, be sure to get your Free Pug Training Mini Course! Holidays are always a great occasion for a little outfit. Dog clothes and photography are a natural combination. Halloween is popular as well as Christmas and New Years. Valentine's Day is also a big favorite. It's not a coincidence that the non-summer holidays are the best. Dressing your Pug up for 4th of July may sound like a good idea but you have to be very careful about the heat. As we said before Pugs are prone to overheating. You should take some care in how the clothing fits on your dog. Measure your dog and make sure the clothing is not too big to cause tripping or too small to cause breathing or blood flow problems. Generally, you measure the dog from the back of his neck to his tail, around his neck and around the chest just behind his front legs. It is quite comical to see a Pug strutting around in their Sunday best. Pug strutting around in their Sunday best. The variations on Pug clothing is almost endless. Keep in mind, however, all dogs are different and some won't want any part of clothing but, generally, if it makes the owner happy it will make the Pug happy. Be especially sensitive, however, if your Pug has come from a "rescue" situation. You never know what experiences your dog is bringing with them and some of them can be rather unpleasant. Click here for a very creative site for dog clothes.